Hello, friends! I’m so excited to have you here today! 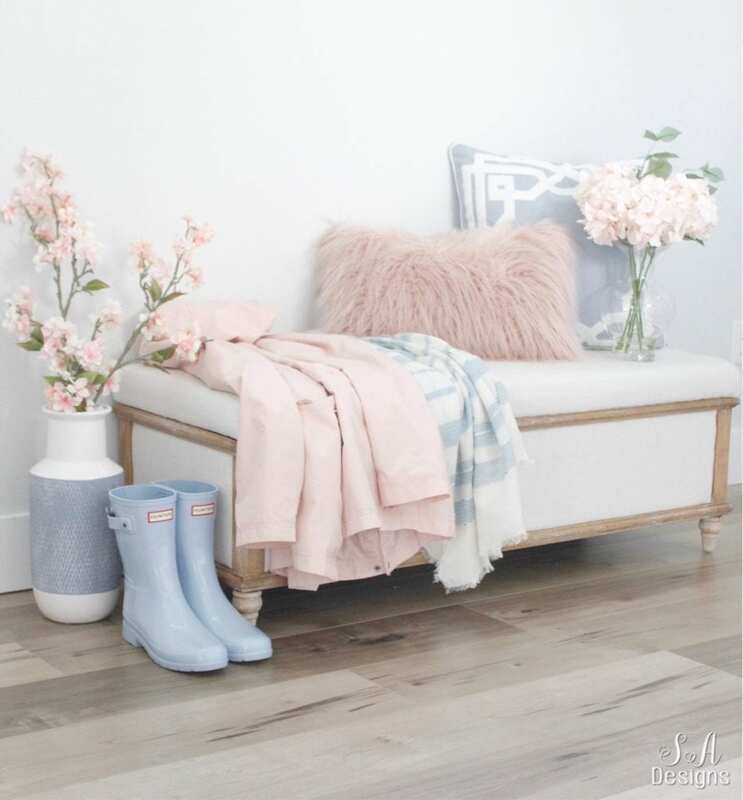 We are gathered again, as a group of interior and lifestyle bloggers, to bring all of you some fabulous spring inspiration. Thanks to our friend Krista from The Happy Housie for hosting our “Seasonal Simplicity Tours” this spring. 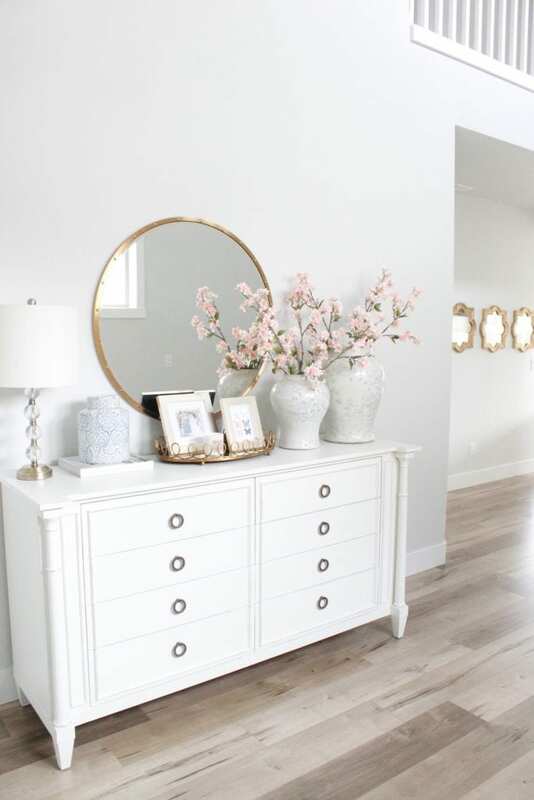 If you are visiting from her blog or from Sincerely Marie Designs, there’s no doubt you have already been pinning inspiration! I have a round-up of all the spring fun I’ve had lately and there’ still more to come. 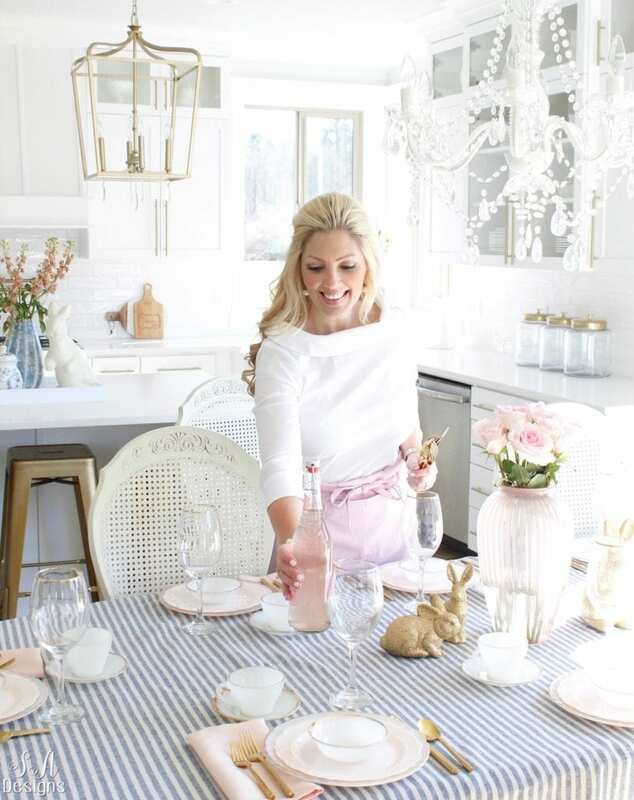 If you’re new here, you’ll see that for my spring home tour I’ve used accents of blush and blue and it’s been so fun sharing spring decorating tips, spring fashion, spring recipes, and spring printables with you! I started off this spring by sharing with you my Rain Gear Round-Up. Spring showers bring those beautiful flowers and we get more than most of you, being in the Pacific Northwest. I don’t mind the rain and it’s so gorgeous here but I definitely find importance in staying dry while being fashionable as well. My mantel before spring was bright and simple with mixed metals. I added a hint of blush and blue to my mantel for spring and even shared another variation for Easter by adding a few things. 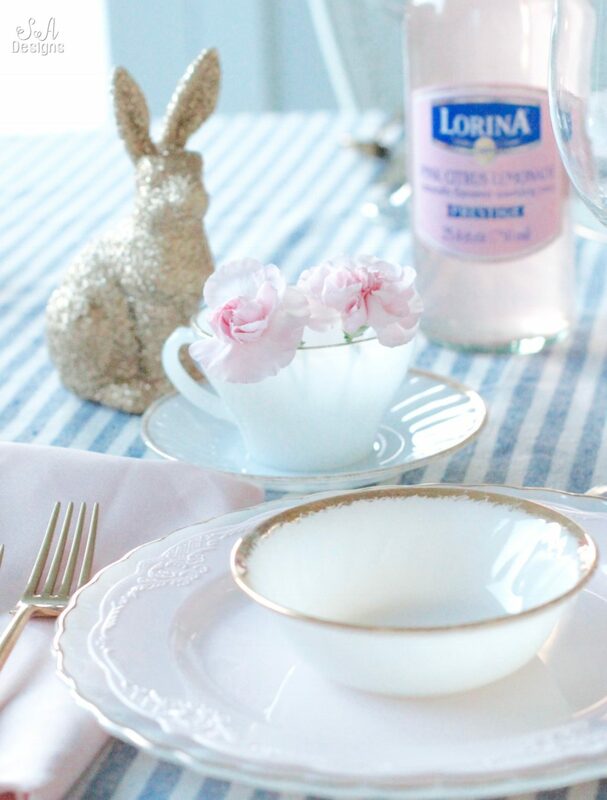 I found the cutest blue striped tablecloth with tassels and knew I wanted to use it for my Easter table with blush pink and a vintage milk glass place setting. This was one of my favorite tables ever, for a few reasons. Read HERE to find out why and to see the tassels on the tablecloth and the entire finished table. 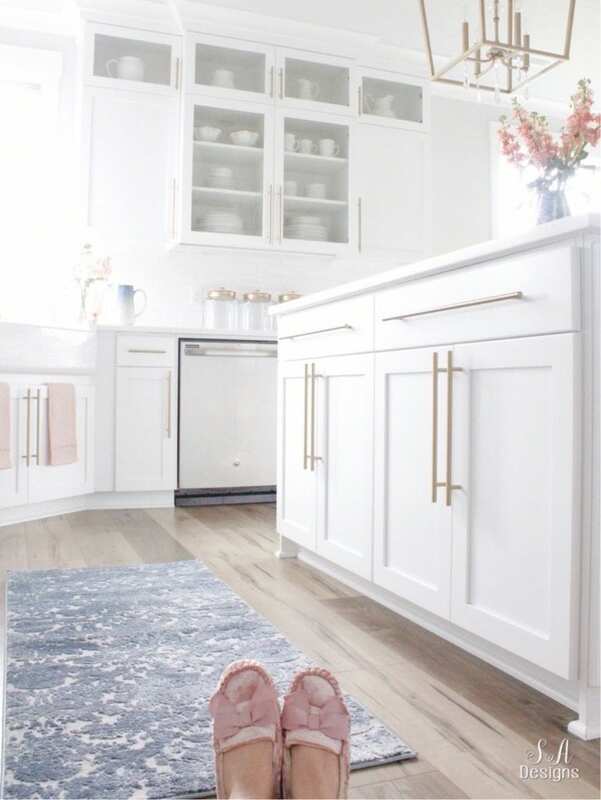 Also in that same blog post, I share how I added pink and blue to my bright white kitchen for the spring and the new rug runner I found. No matter what your spring color palette is, I used things I already had to style my kitchen using those colors. See more and read all about it HERE. One of my favorite things about spring time is that we get outside more…even in the rain! It warms up just a little bit and the sun comes out and we start playing out in the neighborhood again. Being in a brand new subdivision and one of the first ones to build in our cul-de-sac, we now have a bunch of homes being finished and all these new neighbors are moving in. We were soooo excited! 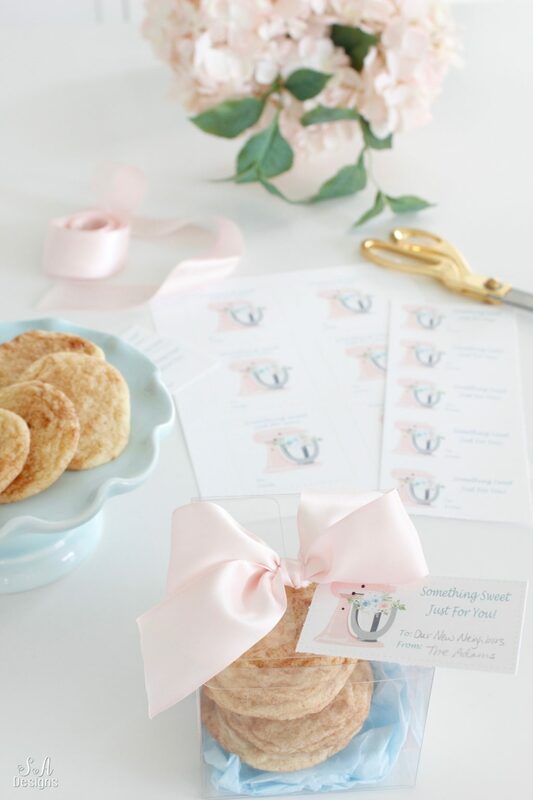 I made these darling printable gift tags for baked goods and shared them with all of you. Brooklyn (my 12 year-old) made delicious Snickerdoodles and we brought these to all our new neighbors (they all seem to be moving in at once) and introduced ourselves and welcomed them to the neighborhood. You can print and use these tags from this post. After winter is over and we put away our hot cocoa bar, I transform the bar cart into a Spring Bar Cart with fun drinks on hand for all ages. 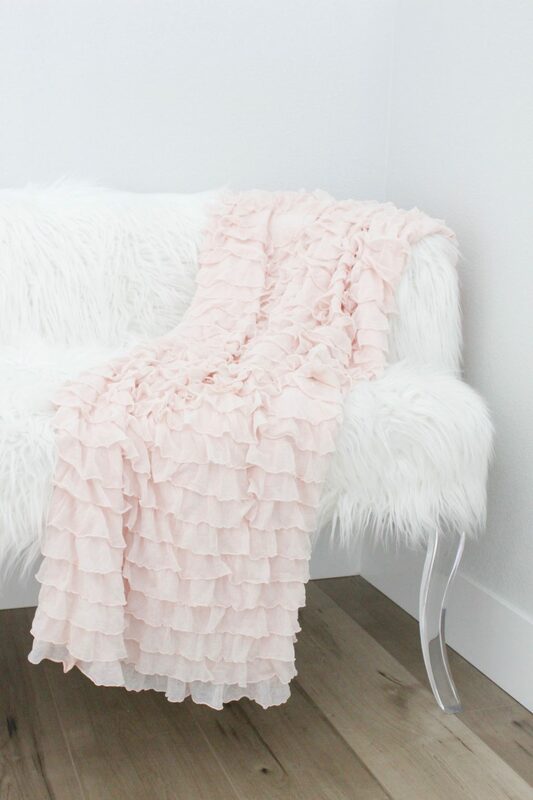 I also share this beautiful and comfortable ruffled skirt for spring. And if company is coming, I put out some baked goods as well. I also like to change up my candles and freshen my home up with fruity and flowery scents and put away all the pine and cinnamon. 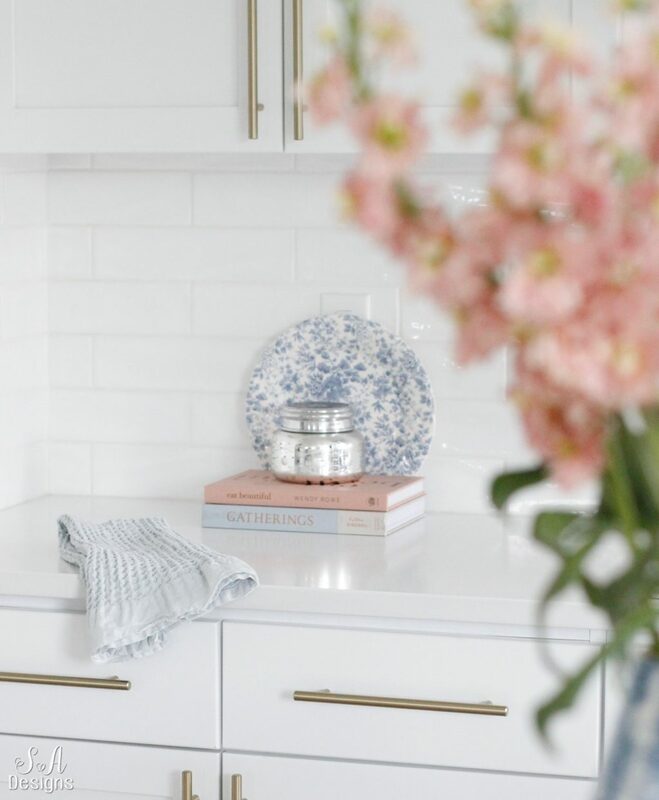 In my most recent Current Crushes post, I share home accents I love for the spring as well as fashion and gift ideas. It’s a must-read! I just love when my girlfriends tell me about a fun find or a good sale….don’t you?! My daughter and I just LOVE to bake and we do it year-round. In the spring, you will usually find cakes and baked goods with lemon or coconut or other fruity flavors. Last weekend we made this Pink Lemonade Chiffon Naked Cake and it was HEAVENLY!! The recipe is easy and sooooo delicious. Find this recipe HERE. I recently received new pillow covers for the spring from Willa Skye Home. 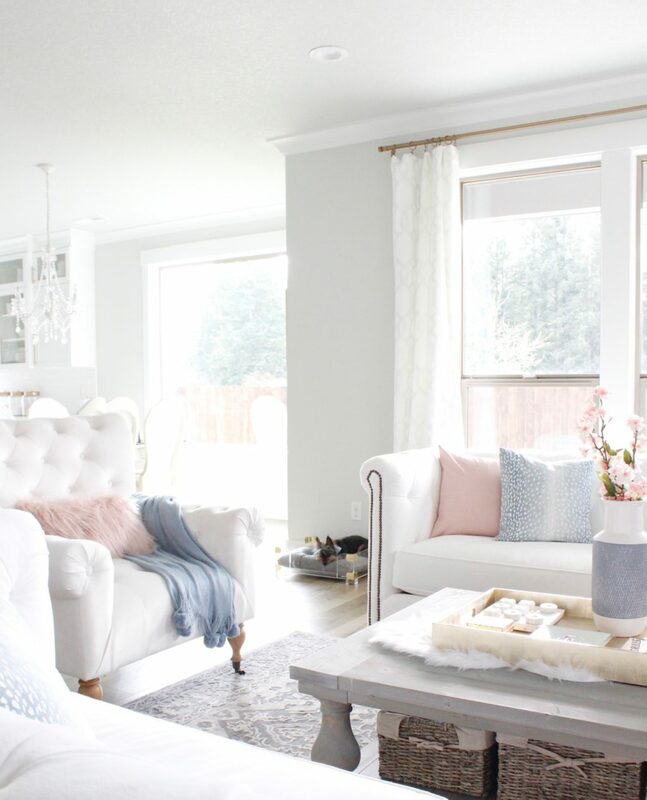 These blush linen pillow covers, paired with the spa blue antelope pillow covers just brought such an elegance to this bright living room for the season. The quality is superb and her variety of fabrics is phenomenal. 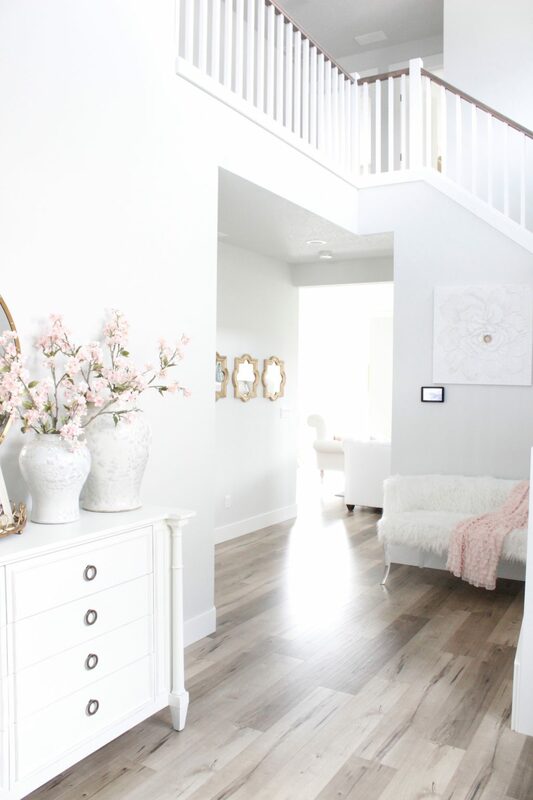 I absolutely loved working with WSH to create this stylish spring look! 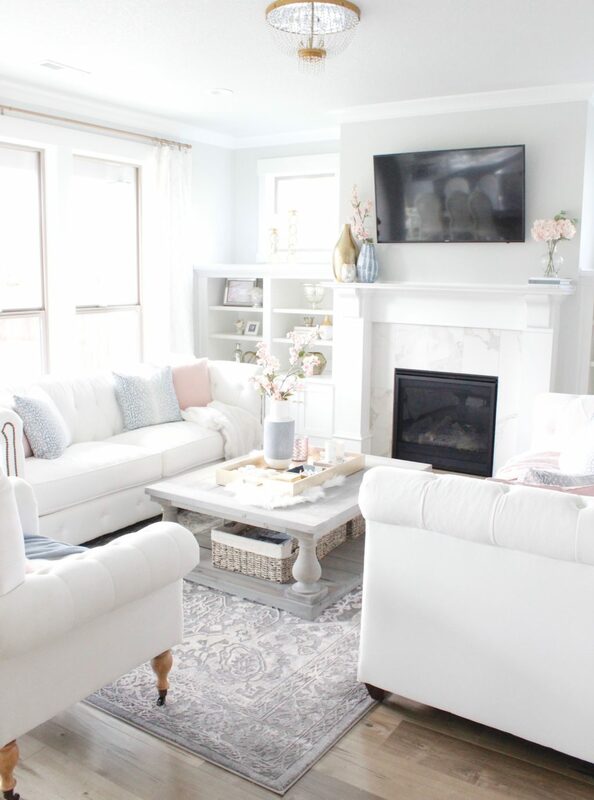 You can visit my Living Room post to get all of the sources on this space and also shopping links. Do you see who else got a new bed for spring? It’s the cutest lucite and brass dog bed I found at HomeGoods a couple of weeks ago and I’m so glad he finally warmed up to it because it looks perfect in the living room! I told you all that I’ve been freshening up my foyer for spring. 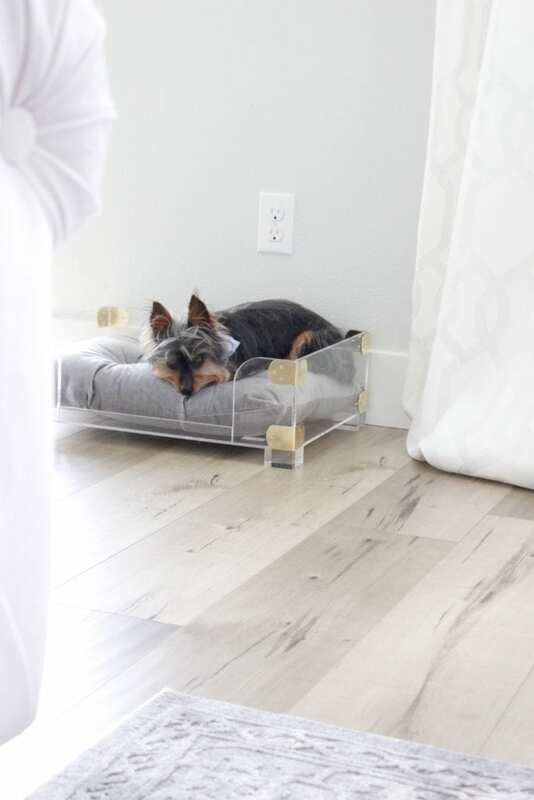 I love to “shop my home” and move things around when I get sick of spaces. I pull out all of my faux flowers and decided to use blush, obviously. And 4 months later, I have to say that this gorgeous chandelier from my friends at Bellacor still takes my breath away every time I go downstairs. Read all about it and the rest of the items in this space HERE and see a closeup of the chandelier. I also stocked up on more faux pink peonies and cherry blossoms from Michael’s. I posted this pic on Instagram (but a more zoomed out shot) and everyone thought they were real. Now, I buy fresh flowers for the house every week but when it’s spring and I really want to bring out a lot of cherry blossoms and peonies and roses and more, it’s wise to invest in some fabulous faux floral stems to save money AND not have to constantly change the water and cut your flowers every day or two. 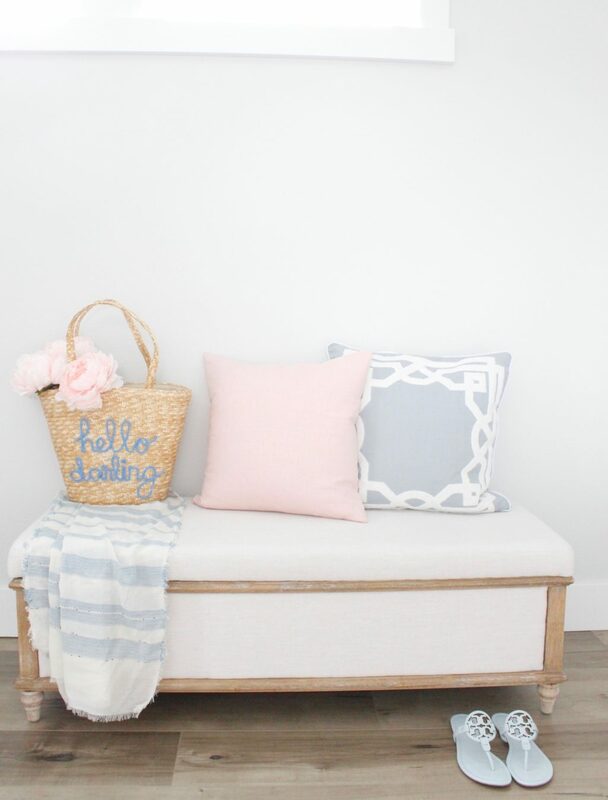 I made some really fun straw totes with Brooklyn a couple of months ago (tutorial coming next week) and put it on our foyer bench with some faux pink peonies. Instead of a faux fur throw and pillows on our bench, as we did in the winter, I used a light scarf that I could easily take with me and even use as a wrap if it’s a chilly spring day. I also used linen pillows on our bench after putting the winter pillows away. And yes….I bought myself a new pair of sandals since it’s warming up and my toes are dying to see the sun. 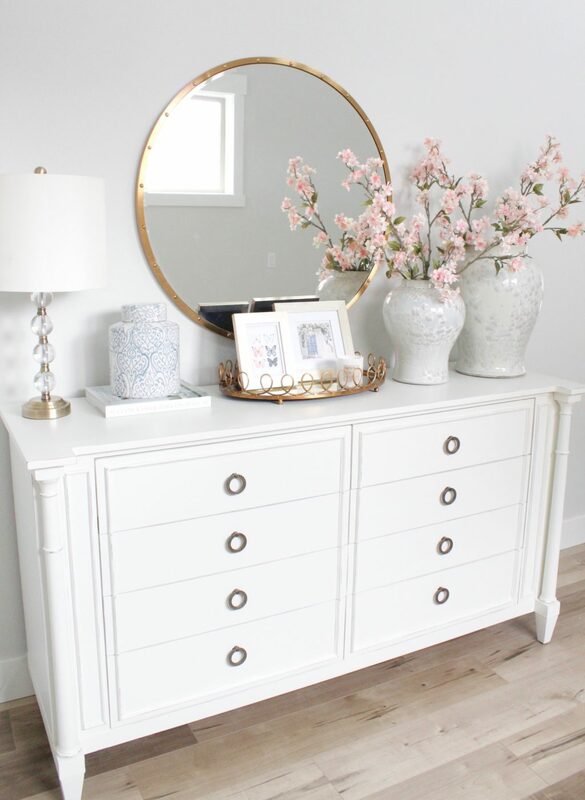 While “shopping my home” I used brought in both of my large and small temple jars and filled them with faux cherry blossom stems. 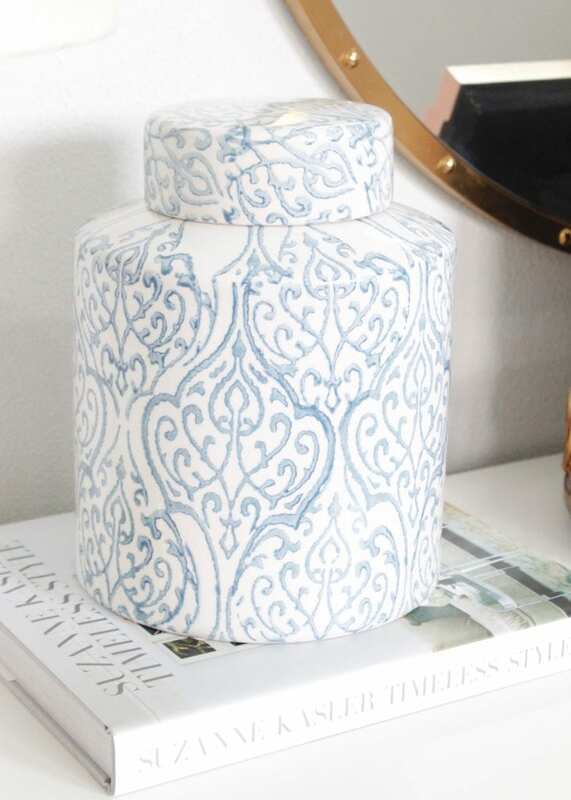 I kept the lamp but also put out a home interiors book I love and my newest GORGEOUS jar from my friend Alyssa. 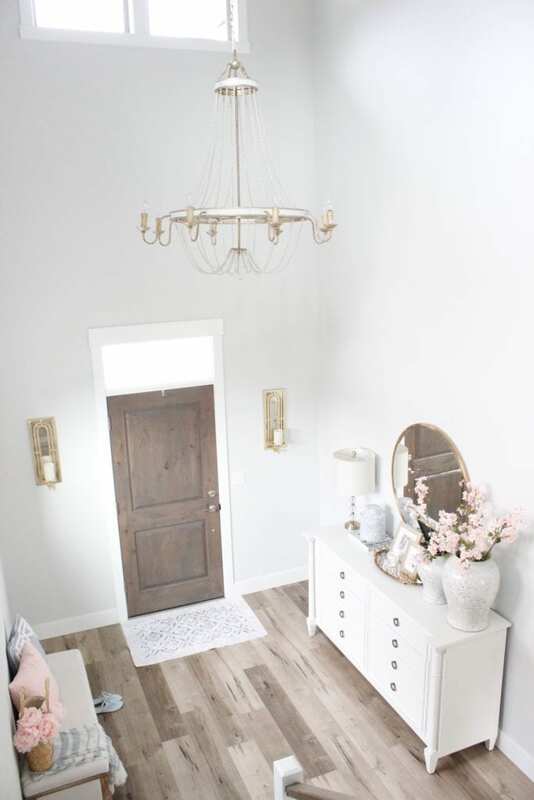 Her shop Amped Decor is so fabulous and I love so many of her pieces. After breaking my last jar that was identical to this, she heard about it and sent me this one. You MUST visit her online shop and see all of the fun things she sells as well as her lovely home. Get ready to swoon! I wanted some framed art on this middle mirrored tray. I couldn’t find anything that I truly loved so I decided to print out and frame one of my favorite pictures of a door in Portugal (where I lived years ago as a missionary) draped in blossoming branches during spring. It has the prettiest blue door and I just look at it and smile, reflecting on some of the best memories. 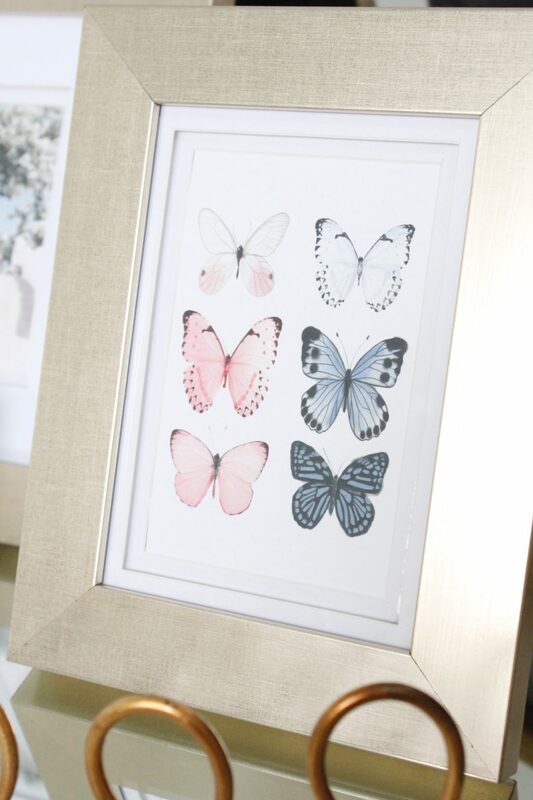 In a smaller frame, I added a print of blush and blue butterflies that I designed. If you’re interested, let me know. I might just add another blog post and offer it as a free printable next week. Butterflies come and you just know it’s spring time….right?! 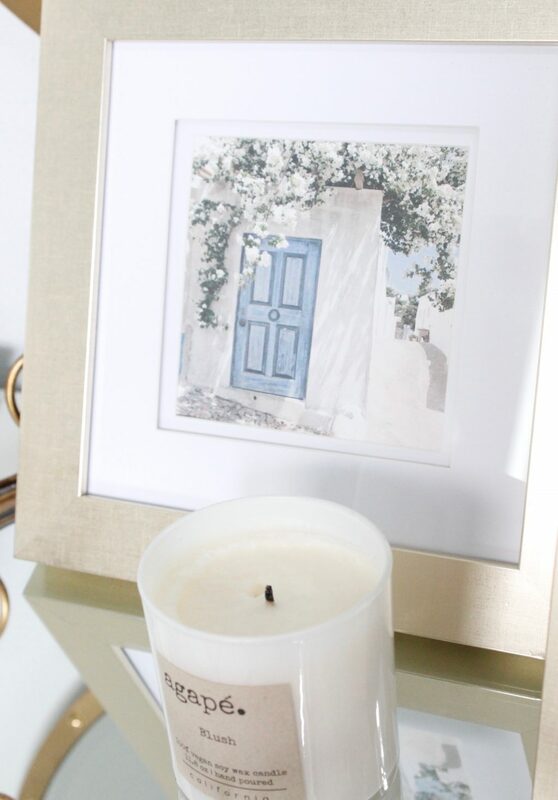 I also added one of my favorite Agape Candles and I think it’s the perfect spring entry table now. 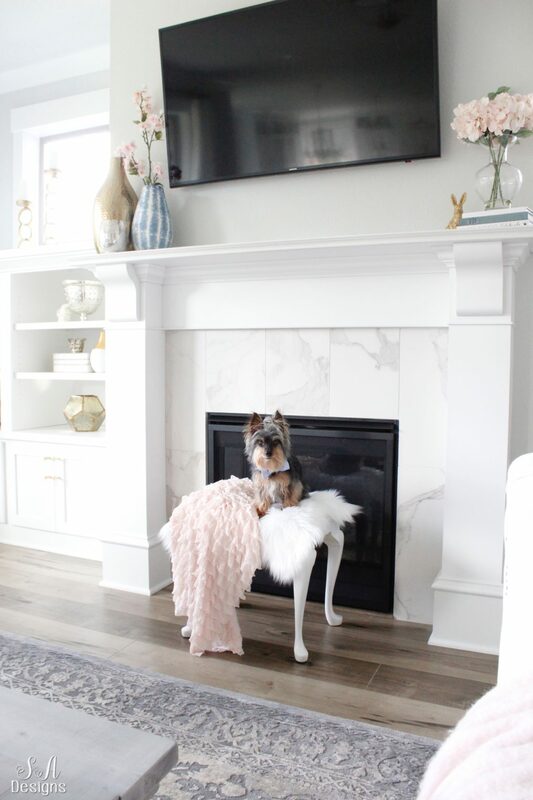 On the other side of our entry, I removed the gray pillows from my faux fur settee bench and added this blush ruffle throw blanket from my online shoppe. 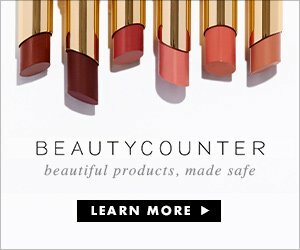 It’s the perfect soft and elegant touch for spring. 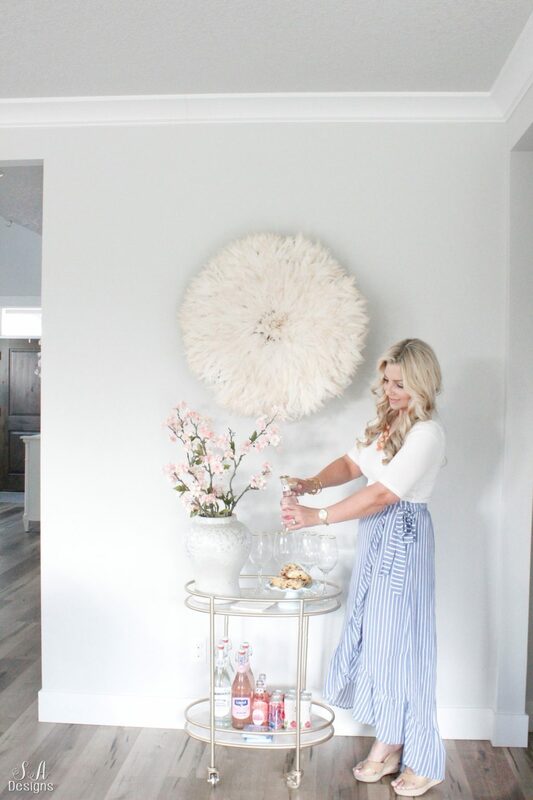 I found this darling and affordable blush and blue geometric dress (here or here) and these shoes (similar here) and loved that they went with my spring interior color palette. You can’t see the earrings very well but they are these ones and are sooooo cute! I’m so glad you could stop by today and THANK YOU for being here! Next, my dear friend Heather from Setting For Four is sharing her Spring Tour and you don’t want to miss it! 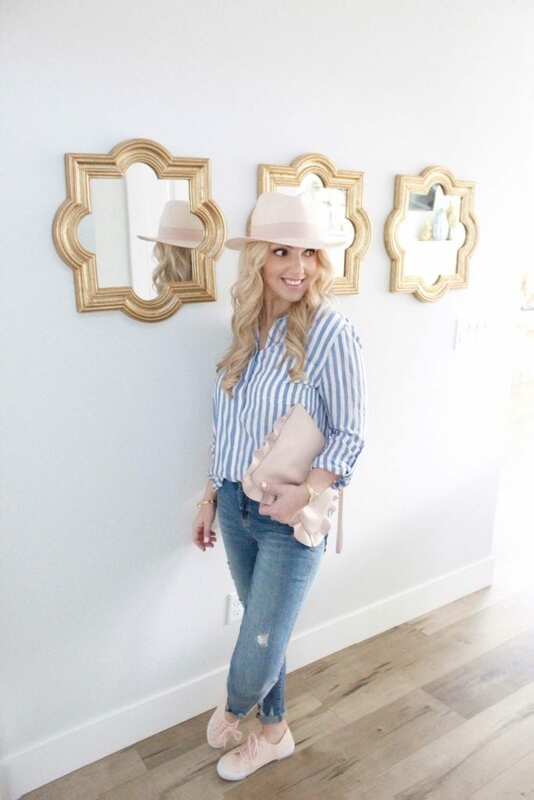 She’s also sharing her love for blush and blue and everything she does is just gorgeous! Girl, your home is a girl’s dream! I never get tired of the soft pink touches. Beautiful tour as always, friend! Summer! Gorgeous tour! 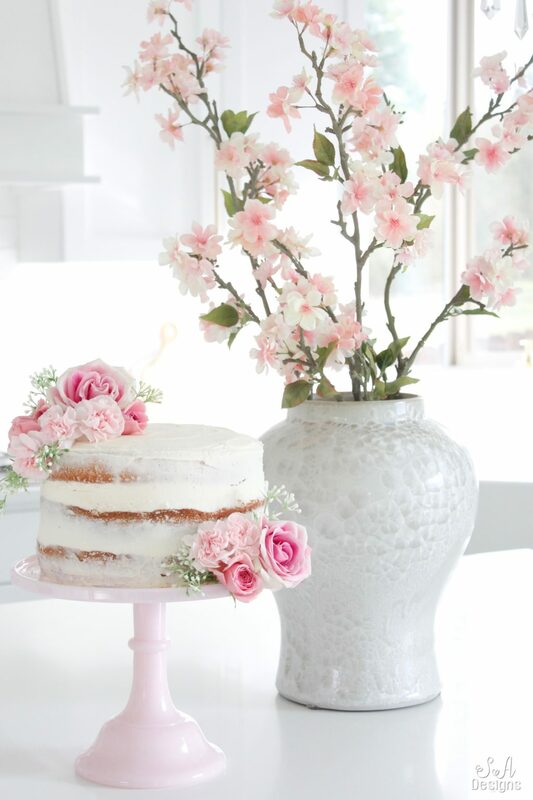 You are the cutest and your home is absolutely stunning – such pretty soft colours for spring! Glad you could be part of this tour series! You have the most gorgeous home, Summer and I love the pops of pink and blue throughout along with your matching outfits!! You’re so gorgeous yourself, inside and out. I’m very new here, Love your taste in decor. What a gorgeous home tour friend!! Love the blue accents you’ve added to the blush- we had the same colors in mind for Spring lol!! Those antelope pillows are breathtaking and I LOVE your dress and shoes!! Happy Spring sweetie! All of this is just breathtaking!!!! I need to go get some faux flowers! Summer, I love everything you’ve been doing for Spring this year! 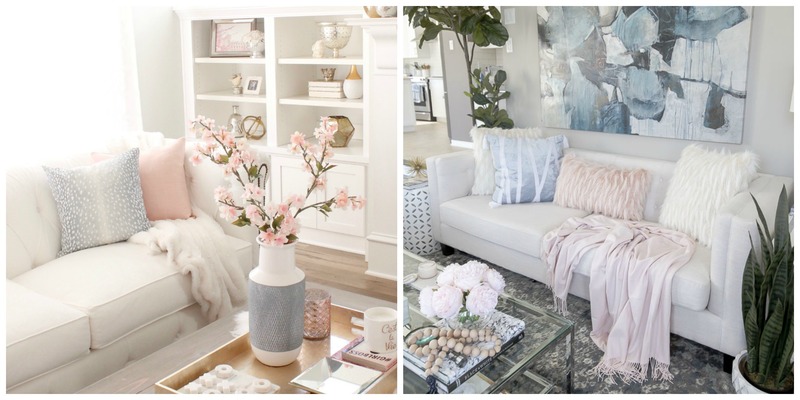 Love your color palette of blush and blue in your home and your fashion! It’s all so beautiful! Simply stunning! Thanks for sharing your beautiful blush and blue hues with us! 😍😍😍Your house is GORGEOUS! 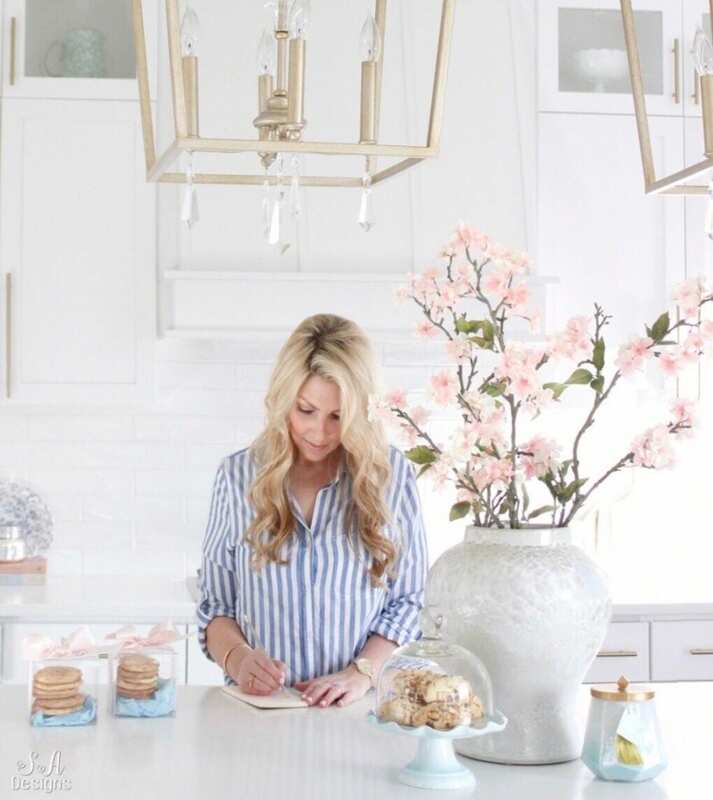 I love how crisp and clean the white cabinets and counters are in your kitchen. 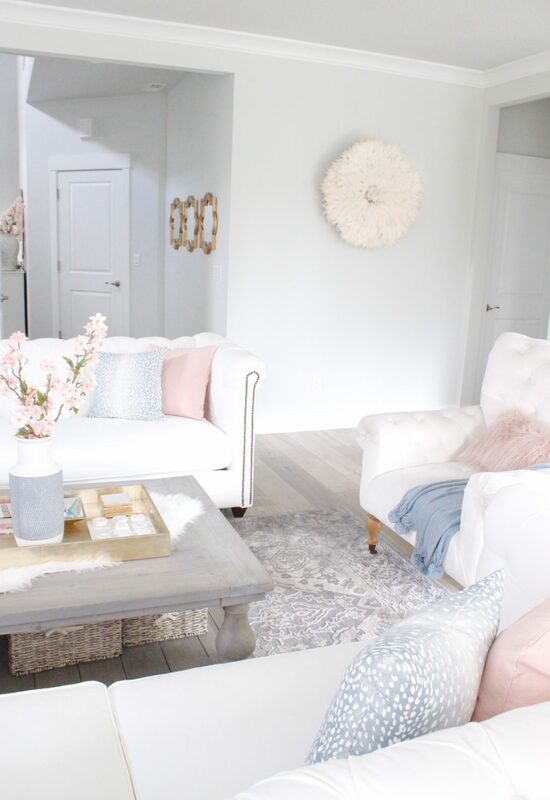 And the fresh blue and blush accents are so springy! 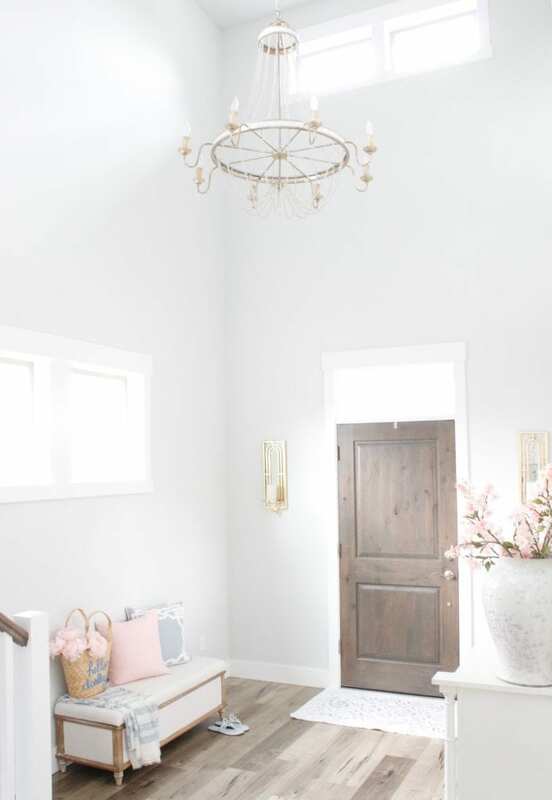 I love that the pastel shades make it feel soft and inviting. Your home is beautiful. Would you mind sharing where your kitchen lights are from? And what color they are? Hi Kelly! Oh thank you so much! 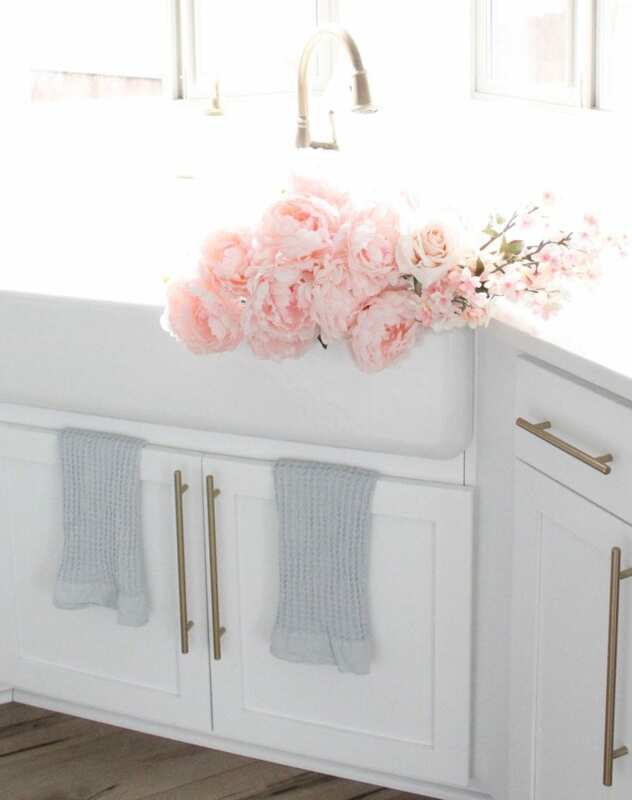 They are like a soft gold, kind of like a champagne color and I have them linked in this post for you below….